Surrender at 20: Red Post Collection: The Pledge Cinematic, Kalista's "Invocation" short story, Upcoming Cassiopeia PBE changes, New LeaverBuster System, and more! Red Post Collection: The Pledge Cinematic, Kalista's "Invocation" short story, Upcoming Cassiopeia PBE changes, New LeaverBuster System, and more! This afternoon's red post collection features a new "The Pledge" cinematic and "Invocation" short story for the recently released Kalista's, as well as Stashu with a list of upcoming PBE changes for Cassiopeia, a reminder on champion price reductions now that Kalista is available, and Lyte discussing the newly updated LeaverBuster system! 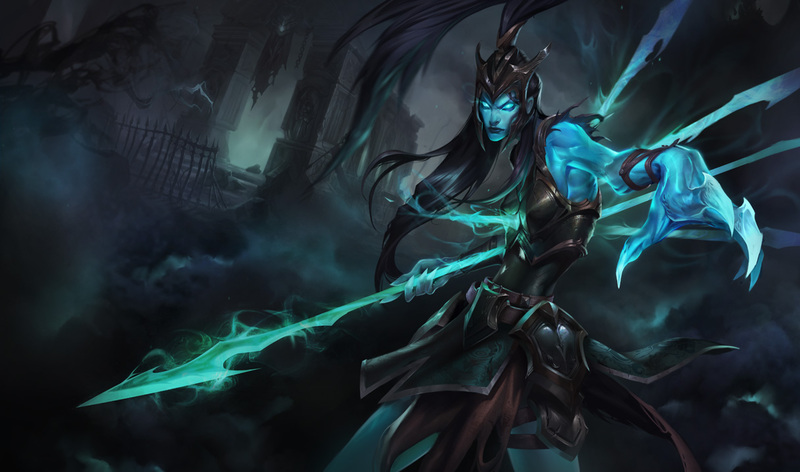 With Kalista now walking the Rift, check out Riot's latest cinematic - The Pledge. Ant in Oz has also published Kalista's short story , which is meant to eventually dwell on her champion page as her long form lore entry! We are still running into some tech issues with putting up our new Champ stories where we want them to live going forward – on the website's champ info pages. However, we didn’t want this to mean Kalista’s story didn’t go out with her launch… so, we are putting her story up here on Boards for now. We hope you like it! A crude effigy of a man, formed of sticks and twine, lay upon a fire-blackened dresser. Its body was wrapped in a scrap of cloth torn from the cloak of the betrayer. She’d pried it from her husband's dead grasp. Alongside it was a hammer and three rusted nails. She paused. Her husband would have pleaded for her to turn away from this path. He would have begged her not to condemn her soul with this course of action. A moment of doubt gnawed at her. The undying specter watched on. An ethereal tether, little more than a wisp of light, linked the newly formed shade to the avenging spirit she had summoned. Through their bond, the sword-wife saw her differently, glimpsing the noble warrior she had been in life: tall and proud, her armor gleaming. Her posture was confident, yet without arrogance; a born leader, a born soldier. This was a commander that the sword-wife would have willingly bled for. With that, the avenging spirit and the shade of the sword-wife stepped into the darkness and were gone." More information on Kalista, the Spear of Vengeance, available here. Stashu has returned to the boards with a list of upcoming Cassiopeia PBE changes he is planning to test! I think we had some amazing conversations in that last thread thread. We're keeping the changes to a medium scope for this patch, but I think we've gone a long way in the right direction. I know there are still many concerns, but let's let this shake out on live for a bit and see where she ends up, then revisit the conversation. A few different things are happening here, like adding straight damage to her early game with the Twin Fang debuff, increasing Twin Fang's ratio early game, and increasing Q's movement speed boost early game. We're also bringing down her late game a touch with some of these changes, but her DPS should still be off the charts. Looking further into the future, hopes are to turn Aspect of the Serpent bonuses into more exciting, lateral-power points instead of super direct boosts to power which make it feel as if Cassiopeia can't be strong until 30 minutes into the game. There was some pretty serious brainstorming towards this end, and it was a huge help for thinking about where we could take the passive, and that was super awesome. With the reliability changes, it was a bit too reliable, so we set the delay at 0.4. Movement speed buff changed to a flat 20% (from 10 / 15 / 20 / 25 / 30%). Since we're adding damage elsewhere on the kit (mostly through this debuff), we decided to take a bit out of Twin Fang's late game. With Kalista's release, both Viktor and Amumu will soon be permanently reduced in price. More info and a schedule of champions who will received a price reduction with the release of future champions can be found at the Riot Support article. Following light testing during the last PBE cycle, the new LeaverBuster system is rolling out to live! Here's Lyte with more information on the updated system, including a new kind of penalty for leavers/afkers. While we hope it doesn’t ever happen, if a player fails to stop AFKing or leaving while in lower-priority matchmaking, continued offenses will result in bans. Leave us your feedback below, and we’ll see you on the Rift! RiotLobster, RiotId, boourns, RiotComplex, RiotWorldPeace, RiotTantram, davin, RiotChomey, stochasticmx, Fr3nch T0ast, Scezumin, Ryedan, RiotNeurocat, RiotZulu, RiotJayway, RiotBlackrook, Christokkies, RiotStopthief, DoctahWayne, RiotNoyz, and RiotExLibris. Finally, thanks to the players who helped test the LeaverBuster and find some bugs! The ones who completed the tests will be sent a RP bump in their main accounts over the next few days. RaXSpIkE123, iSPZ, ZedRex the 1, T0MMYNAT0R, James Franko, BrandonJamYo, FlashnFuse, IEGP, johnc12369, The British, Grinzpilz, iMNAZAL, Murishani, The Feeder, iPuddingPie, iivan, DotZip, TheCosmicWave, TorretDunker, Yaknose, Tacoworld501, Saerus, edstars101, Wolfeur, Feichti1996, ALEXKOND, Hakaisha89, Ayowel, Lao Fu the Tiger, RendingSaber, Dwark, unknownXX, shrimpp0123, quincymccoy, Intilink, CCkeebs, Zehel72, xStah, xonra." "All servers have LeaverBuster, although we're turning it on one server at a time over the course of 24 hours." "That's right, all matchmade queues will be affected by LeaverBuster." "Whether a player DCs or intentionally leaves, it's still a ruined experience for 4 to 9 other players in the game. Although it isn't the player's "fault" when they unintentionally DC, it's even more unfair to penalize up to 9 players per game while a player figures out their connection issues. If you DC from a game, fix your connection first before playing more games." "The system is designed to punish leavers and AFKers. It is not designed to punish people who need to relog." "If you DC and relog into the game quickly, you'll be fine." "In these scenarios if you end up reconnecting in a reasonable time, you won't be flagged at all. If it takes 20 minutes and the majority of a game to re-boot the client and reconnect, you might be flagged for that particular game; however, the system probably won't punish you for that single game. If you repeatedly do the above in numerous games and always take 20+ minutes to reconnect, you'll be hit with a penalty because you still are ruining the games of 100s of players." "It really depends how often you leave. For example, leaving 10 games in a row will still flag your account even if you had a perfect history of no leaving. If you leave in just a few games, you might still get a light 5 minute low priority queue penalty (which is light, and something we're OK with)." "We'll keep an eye on how leaving/afk rates change as a result of the new system and more aggressive penalties. If the frequency of these incidences remains higher than we are comfortable with we'll investigate some more solutions. One idea that we're tinkering with is if a player fails to connect to a game, we allow players to "reset" the match without any penalties to the players in the game. However, the player that failed to connect gets the same LeaverBuster penalty."